The Rundle Mall Management Authority (RMMA) is a subsidiary of Adelaide City Council and provides the strategic administration, governance and overall management behind Adelaide’s premier retail precinct, Rundle Mall. Rundle Mall is synonymous with bridging the gap between retail initiatives and creating both in-house events and harnessing those in surrounding areas, to create a seamless City experience in and around the Mall. The RMMA engaged The Digital Embassy to act as their strategic digital partner to help provide assistance and direction in generating greater public engagement and interactivity online with Rundle Mall through campaign specific content and touchpoints. To date, The Digital Embassy have provided direction on a variety of strategic digital marketing initiatives and website functional improvements that support the overall marketing strategy. 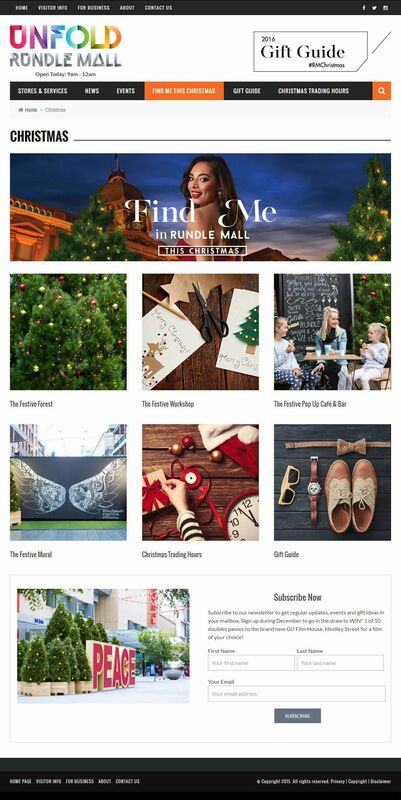 The Digital Embassy helped provide the strategic framework and planning for Rundle Mall’s social media calendar for both the Find Me and #RMChristmas campaigns during 2016. 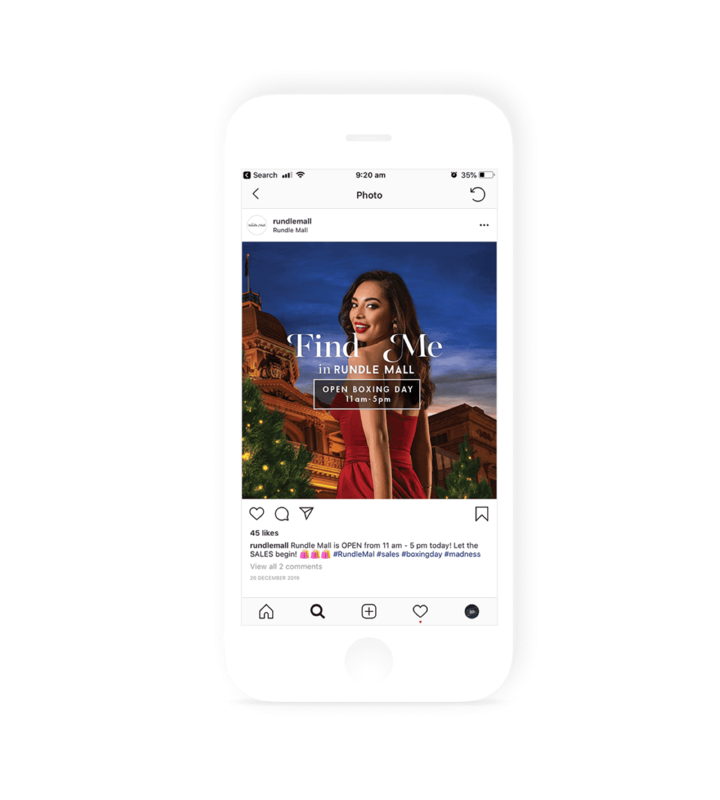 Rundle Mall’s Find Me campaign was created to help further their brand awareness with the goal of increasing the publics engagement with the Mall, both off and online, targeting their core audience types. 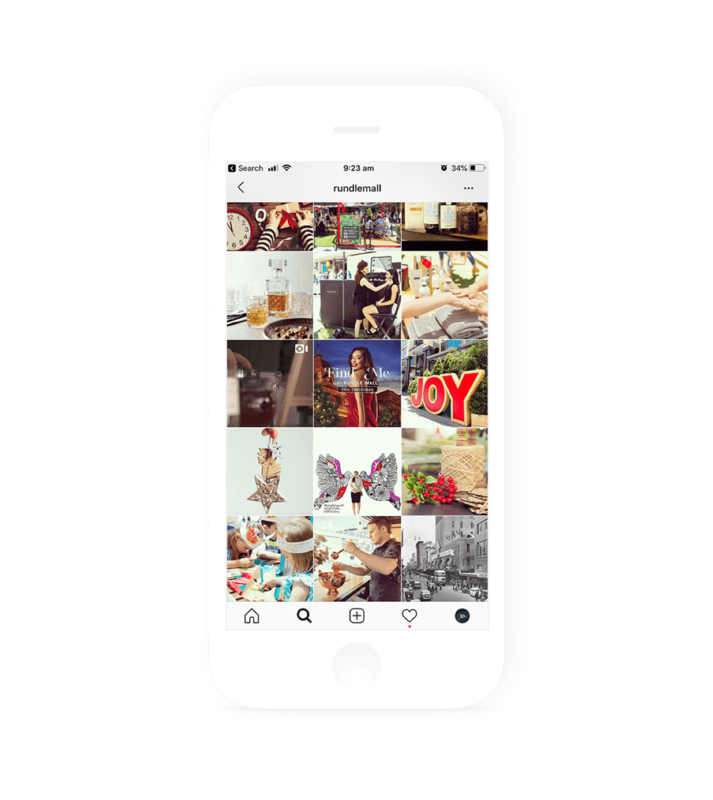 The #RMChristmas campaign was required to cater messaging to speak to a broader age demographic and featured the integration of retail, event and operating hour messages. The Digital Embassy assisted with the creation of content calendars and provided strategic assistance to consolidate all brand elements into one seamless campaign. To assist with curated social media content and online promotion of Rundle Mall events and messages, as certified Google Partners The Digital Embassy implemented paid advertising campaigns across the Google Display Network and on social media platforms to further enhance brand awareness and campaign milestones. Paid advertising measures carried out by The Digital Embassy on behalf of RMMA reached an audience of over 450,000 through targeted text, image and video messaging over the course of the 8-week long campaign. 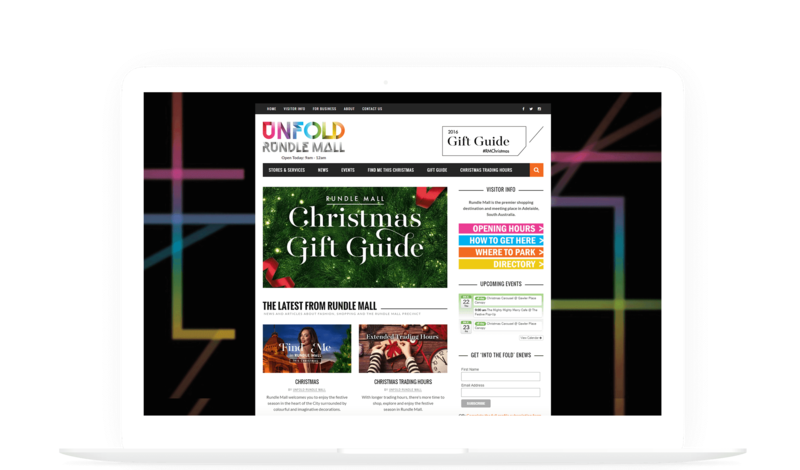 Created specifically for the #RMChristmas campaign, the Rundle Mall Gift Guide was developed to provide the public with access to current retail offers relating to appropriate stockists, featuring store information such as location and operating hours to increase likelihood of purchase. This initial wish list feature will be further developed in-conjunction with future campaigns to continue to improve Rundle Mall’s retail offering online and enhance customer relationships with the 700 specialty stores within the precinct. 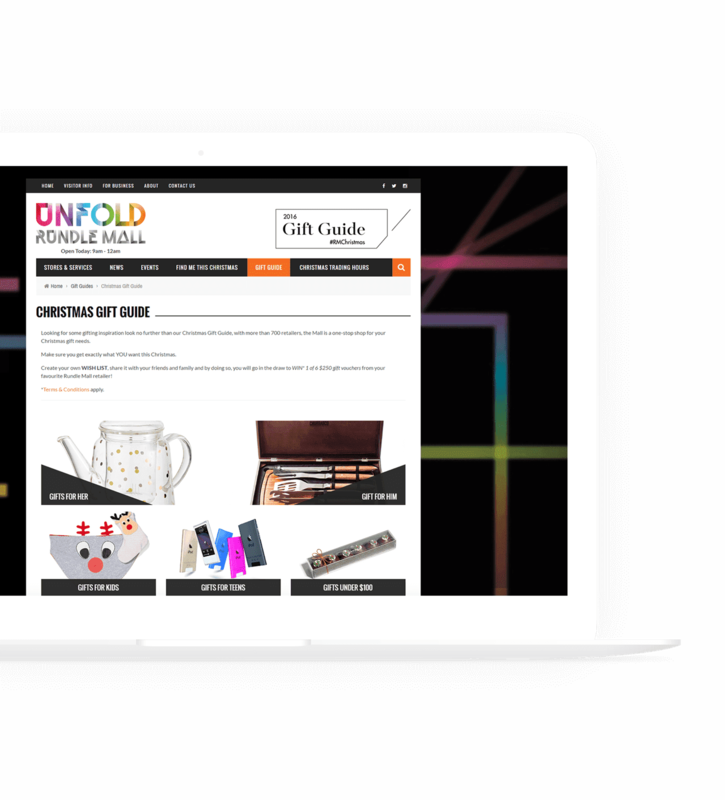 The digital partnership between The Rundle Mall Management Authority and The Digital Embassy has been successful in helping our client bridge the gap between their online and offline engagement. A strong and thriving offline following is now being harnessed through online initiatives that connect users and campaign touchpoints which provide greater access and interactivity online with the retail outlets that operate within the precinct. At the conclusion of the #RMChristmas 8-week campaign for 2016, in addition to the 450,000 strong audience garnered via paid advertising. A social media increase in followers of 17% was generated across both Facebook and Instagram, in-line with desired KPI’s set prior to the campaigns commencement. The Digital Embassy are excited to continue their relationship with RMMA and adopting the learnings and experience gained through these campaigns to help drive greater engagement between the Mall and their audience through exciting online and offline elements that further enhance and grow the Rundle Mall brand.